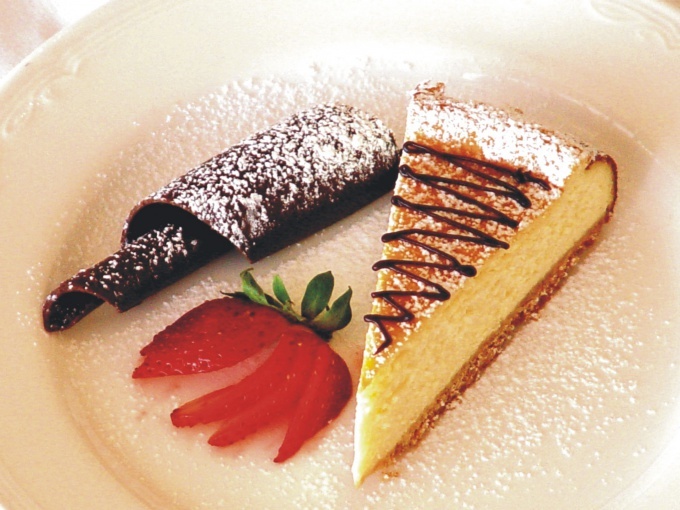 Cheesecake is a soufflé of ricotta or cream cheese with a base of crushed biscuits, shortbread or biscuit dough. This easy cake is delicious by itself, and if to show imagination and decorate it, the dish is simply wonderful. Berries for decoration: 500 g of any berries; 2 tablespoons of powdered sugar; a few mint leaves. For a picture of the cocoa: 2 – 3 tbsp cocoa powder; 1 sheet parchment paper for baking. For the chocolate glaze: 100 g butter; 5 tablespoons milk; 7 tablespoons sugar; 5 tablespoons of cocoa powder. To decorate lime: 1 Cup cream 35% fat content; 1.5 cups sugar; 0.5 Cup of coconut; 1 lime. For the jelly: 2 teaspoons gelatin; 3 tablespoons water; 200 grams any berries, 5 tablespoons of powdered sugar. Decorate the cheesecake with berries is probably the easiest variant of registration. Take any berries, wash them, dry thoroughly and place on top of the pie. You can take this raspberries, strawberries, blueberries, currants. Most importantly, choose ripe and whole fruit. Sprinkle the berries with powdered sugar and garnish with mint leaves. Decorate the cheesecake with cocoa powder or instant coffee. To do this, cut out of food grade paper circle with the diameter of the form in which you cooked the pie. On this circle, draw and then cut out any figures you wish – circles, stars, hearts. Place the stencil on cake and sprinkle with a sieve on the cutout figures of cocoa powder. Then carefully remove paper. The cheesecake will appear to figure. In the same way using stencils, you can decorate the cheesecake with chocolate chips. But if the top of your cake dark, then sprinkle it with white chocolate or icing sugar. Top cheesecake with chocolate glaze. To prepare it, melt the butter in a saucepan, add the sugar, cocoa powder and milk, bring to a boil. Constantly stir the glaze and cook until it begins to thicken. The finished cake drizzle with glaze. Decorate cheesecake with lime - this adds a little acidity to your pie. For a start, whip the cream with a glass of sugar to make a dense mass. Using a pastry syringe, apply whipped cream on the surface of the pie. Put the cake in the fridge for 4 hours. Lime peel, remove the tape, and the flesh cut into small slices. Mix sugar and coconut shavings. If desired, instead of sugar you can use powdered sugar. Roll the slices of lime in this mixture and place on cake on top of whipped cream. Cover cheesecake jelly mass. Gelatin cover with water and leave for 15 minutes. At this time, berries and powdered sugar and put on fire, stirring constantly, until the berries give juice. Thoroughly mash the berries, strain them through a sieve and mix with the gelatin. All this mass of warm on low heat until the gelatin is dissolved. Pour jelly on top of cake and leave in the cold until firm. Don't go overboard with the design. Still "highlight" the cheesecake in its minimalism. It is therefore particularly prized open a cheesecake, without the defects of the upper part, decorated only with a leaf of mint. Decorate the cheesecake until it is completely cool. Besides all the above, cheesecake can be decorated with dried fruit, nuts, zest, candied fruit. Serve cheesecake to the table along with the dessert sauce of berries and chocolate.